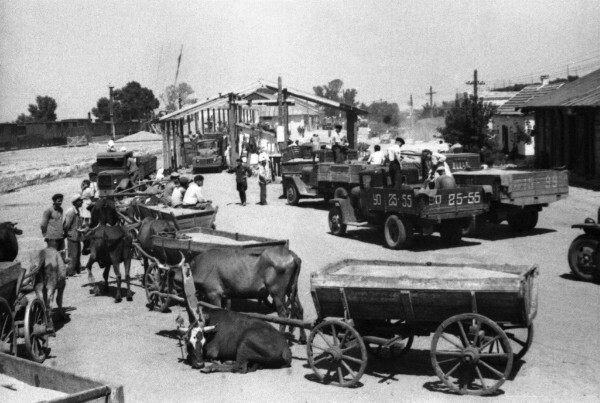 Famine of 1946–7. A year after the end of the Second World War, many of the inhabitants of central and eastern Ukraine experienced hunger as a result of a drought that exacerbated the general wartime collapse of agriculture. But the Soviet government refused to lower delivery quotas on grain and other products that it had imposed on the peasants. Moreover, the authorities pushed hard for the delivery of foodstuffs and threatened local officials for hoarding or sabotage if they failed to meet their quotas. A substantial amount of the foodstuffs that were requisitioned were exported to Soviet-controlled Poland, Czechoslovakia, and Bulgaria. As a result of the onerous food confiscations, famine conditions emerged. The famine did not occur in newly annexed Western Ukraine because the collective-farm system (see Collective farm) had not yet been introduced there and the resistance of the Ukrainian Insurgent Army rendered food procurement difficult. Therefore many peasants traveled there from Ukraine’s central and eastern oblasts to beg for bread, and in the summer of 1946 trains going westward were crammed with starving people. The authorities tried to stop the exodus by police methods, forbidding western Ukrainian peasants to sell food to newcomers and spreading rumours of epidemics and poisoned food in the western oblasts. The Soviet regime did not acknowledge that a famine occurred in Ukraine in 1946–7. Estimates of the number of people who died vary widely, ranging from 100,000 to upwards of one million.